The Explore and Focus Phase curriculum requires each student to take two Advanced Patient Care clerkships, one of which must be a Sub-internship, in order to graduate. The criteria and process for designating advanced clerkships is described below. 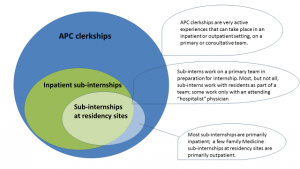 What is an Advanced Patient Care Clerkship? Description of experience: This is a four-week, full-time clinical experience during which the student acts at an advanced level in either an inpatient or outpatient setting. Most, but not all of these experiences will also fit criteria for a sub-internship. The student must work under the direct supervision of one or more attending physicians or senior residents in the manner of a first-year resident in that specialty. The student must have access to regular supervision and feedback while being permitted the opportunity to function somewhat independently as appropriate for the student skill level. The Graduation Audit Report in AADB to count the clerkships that each department designates as Advanced Patient Care. Curriculum tracks which Advanced Patient Care and Advanced Patient Care Sub-Internship experiences meet the requirement and which are in excess of the requirement. As required clerkships, the first two Advanced Patient Care rotations to meet the graduation requirement qualify for travel reimbursement. Please direct any questions to somclrk@uw.edu.